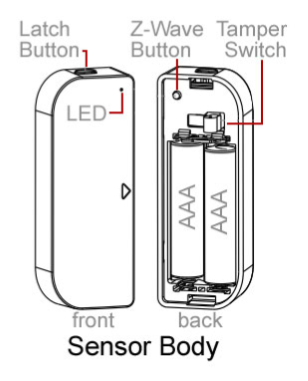 HS-DS100+ is comprised of a sensor body and a magnet piece. 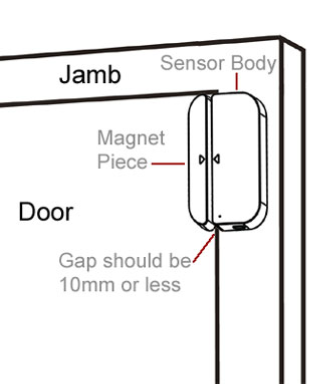 The sensor body is (typically) installed on a door or window jamb. The magnet piece is (typically) installed on the door or window. When the door or window are closed, the magnet trips a switch inside the sensor body and a Z-Wave command is issued. When the door or window are opened, the switch is tripped again and another Z-Wave command is issued. The sensor body and magnet piece must be mounted to the door or window (vertically or horizontally) using the provided screws or double-stick tape (your choice). Leave a gap (no wider than 10mm) to allow the door or window to open and close easily without obstruction. If using screws, you’ll have to the mount the backing plates of the sensor body and magnet pieces first. To do this, press the latch button on the sensor body and gently pry off the backing plate (plate can be difficult to remove). Then, use a small slotted screwdriver to remove the backing plate from the magnet piece.